As Cisco and I walk in the evening, were serenaded by a zillion locusts, signaling the end of summer. I dont know if theyre really locusts, but they are some sort of creepy insect. When I was a kid at my Grandmas in southern Indiana, they were called Katie-dids. Sometimes, they sang out Katie-didnt. Their erie noise reminds me of summers at Grandmas, when we entertained ourselves mostly outdoors with our imaginations. A double roped swing from an enormous oak tree paired with a rickety old ladder became a ship, where we sailed for many hours on lazy summer afternoons. A blanket thrown over the clothes line became a tent, where we insisted on having our lunch. The natural sand pile was the original organic kitchen, where we concocted elaborate cakes and pies for Grandma to admire. The mal carriers arrival became a major event each day. My cousins and I would argue over whose turn it was to go collect the letters and magazines from the mailbox by the gravel road. No Johnny, it was your turn yesterday, Carolyn and I would say, even though he hadnt had a turn in a week. On the days when my Jack and Jill Magazine or The Weekly Reader was delivered, Id flop on the feather bed and lose myself in stories, jokes, and games. As the sun would go down, and the Katie-dids would begin their chorus, Grandma would be in her tiny kitchen, frying meat, peeling potatoes, and slicing plump juicy tomatoes from her garden. She would have picked the vegetables from the garden, early that morning, before we kids were awakened by the songs of a thousand birds in the woods nearby. Then after sunset, and the birds settled down for the night, and the Katie-dids did or didnt for the day, the crickets tuned up their fiddles. Our evenings entertainment was to sit on the front porch with Grandma and listen to her stories or catch lightening bugs in a jar. The last song of the day would be an old hymn that Grandma would lead, Love Lifted Me, The Old Rugged Cross, or I Walked in the Garden Alone. Sometimes she would sing the melody and sometimes alto, and sometimes both in the same song. Thats how Carolyn and I learned to harmonize. I hear all these summer sounds and feel the tenderness and innocence of that time in my life. May it rest in peace. This post might have been titled Guardian Angel, but you might have thought it was going to have a religious theme. But its the story of Ciscos first solo walk home from our training session in town last Saturday. 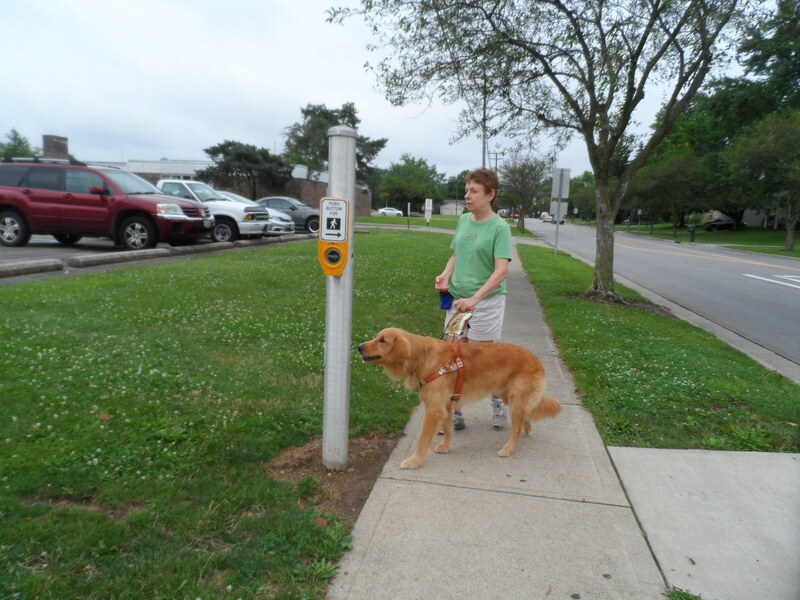 Kara and I had worked with Cisco on finding the pole that has the audible signal button, finding the right place to stand where well be lined up correctly for the crosswalk, walking straight across the street within the crosswalk lines, and turning into the 2 businesses I wanted to patronize. It was an intense workout for everybody. Because the downtown area is about 2 miles from my house, we drove part way and parked about a third of a mile from downtown. When we started home and approached the place where the car was parked, Kara suggested that I might want to go ahead and walk the rest of the way. 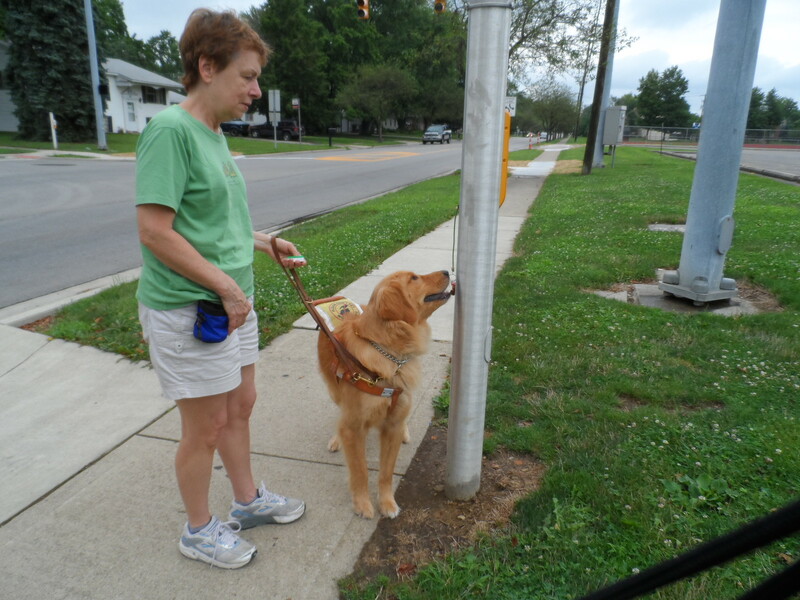 I had walked that route dozens of times with previous Seeing Eye ® dogs, and Cisco had the basics down pat, so I was comfortable with the idea. What touched me was that Kara was too. She saw that even though Cisco is young and inexperienced, he demonstrated that together, as a team, we were quite capable of going the distance, without Karas watchful eye. You know how you felt when your kindergartner walked to school by himself the first time? Or when your 16-year-old daughter drove down the street by herself for the first time? Its not exactly the same, but there must have been a little of that feeling as she got in her car and then passed us by as we walked. Then, it started to sprinkle. No problem. We had walked in pouring rain in Manhattan, in our early training. Then it rained harder, and I heard thunder in the distance. No problem. I had my cell phone, in case I needed Kara to come and get us. At the beginning of the last third of the route, we had to cross a busy street, but it has an audible signal. This should not have been a problem. But with the rain and the traffic, I couldnt hear the ticking sound it makes to help you locate the pole. Cisco was not familiar enough with this crossing to show me the pole yet, so it was up to me to find it. My talking GPS told me that I had passed the street, several times, that I needed to get to, but I couldnt find the pole that held the magic button that would stop all the cars. Then out of nowhere came a womans voice. You want some help? Oh thank God, it was Kara. Apparently, she had parked nearby and had observed my predicament. She agreed that the ticking sound was not loud enough to hear it over the traffic noise, so my fears of losing my hearing were allayed. After we located the pole, pushed the button, waited for the voice of the audible system to tell me it was safe to cross, off we went toward home. Kara wont always be there to rescue me, I know, but having a guardian angel at a crucial time I recognize as a blessing. Since then, Ive called the city and asked them to turn up the sound a notch or 2, and Kara and I did some clicker training with cisco at that pole. Today, Cisco and I traveled that route alone. The clicker training worked, and the audible signal was audible. Kara wasnt there, but a different kind of guardian angel was. Karas confidence in Cisco, affirming my own, was the key to completion of a successful training session. It was 9:00 in the morning, and the Ohio skies were blessedly cloudy, so our training walk with my daughter Kara was off to a good start. Our goal was to reinforce in Cisco’s mind, and in mine as well, the safest route to my beauty shop. 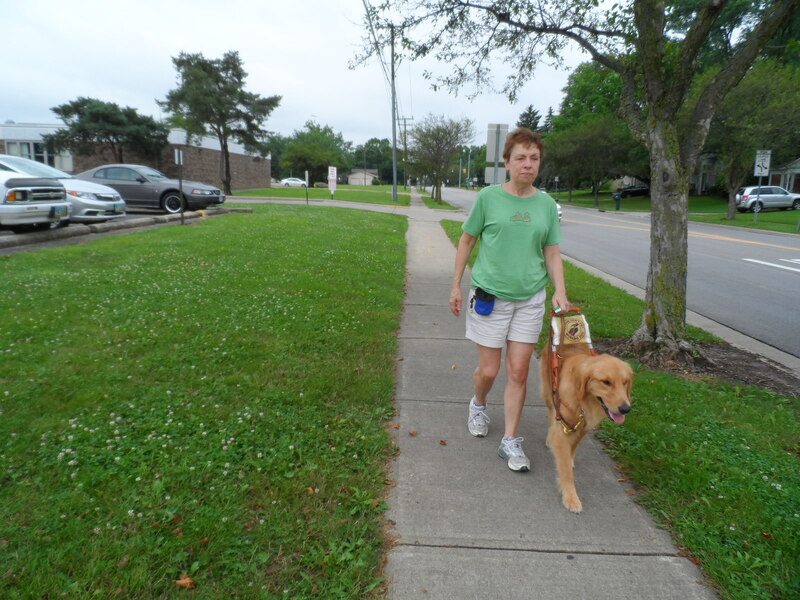 This route was one of the major reasons why I needed a replacement guide dog. Pippen had become too old to make the 3-1/2 mile trek. 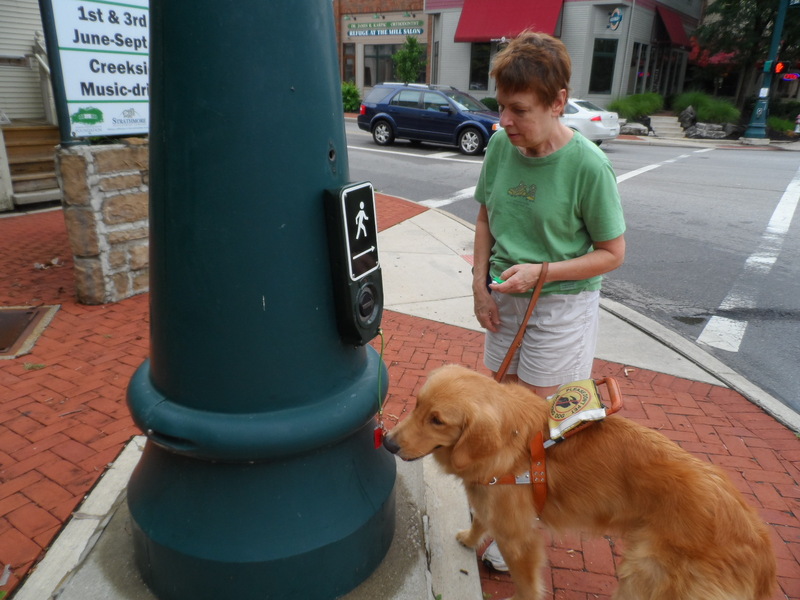 It’s not the distance that is the challenge for me and my brand new Seeing eye ®, but the complexity of the street crossings in the downtown area. Yes, there are audible signals, but rounded corners with blended curb cuts require spot-on alignment with the crosswalks and the flow of traffic. Facing just 20 degrees off course can confuse the dog when you tell it to go forward, but you really mean sort of forward, but stay in the crosswalk. Then there are alleys to cross with no tactile cues at all, except the subtle change in acoustics when there is a gap in the sound bouncing off the buildings. I had never worked Pippen to the beauty shop alone, so I didn’t have the confidence I needed to direct a new dog. Enter Kara. She flew in for the weekend for the dual purpose of helping me with Ciscos training and with handling some issues with my mother in assisted living. 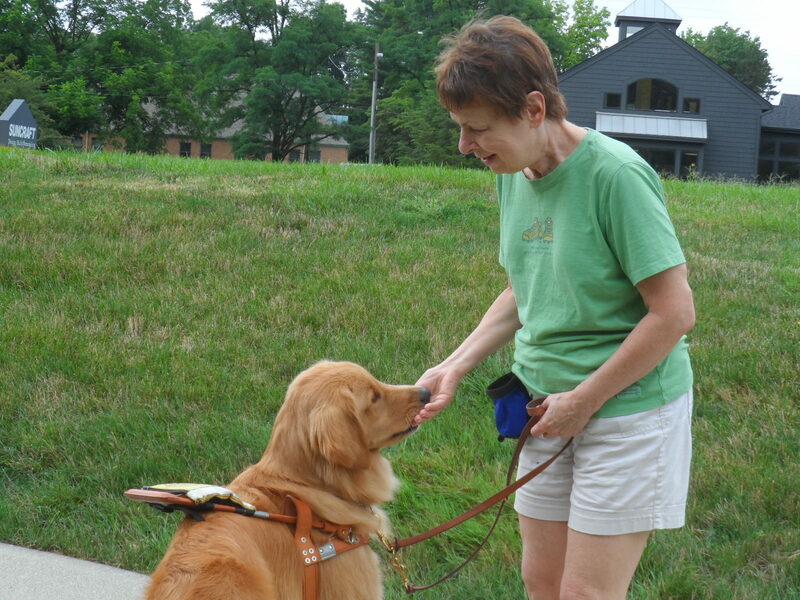 Because I had to leave my Seeing Eye ® instructors back in Morristown, NJ, I’ve had to recruit friends and family to fill in as sighted assistants. My son Steve was given the task on the first Saturday Cisco and I were home, following behind us as we walked the route to church. I needed Steve to alert me to any potential problems that he could see and that I might miss and to help me direct Cisco to turn into the church driveway. Again, there is no tactile or audible cue, so its up to the dog to see where we always turn in. Same with my own driveway. My friend Dan filled this role as Cisco and I practiced walking to the grocery store, making sure I had my shoulders angled to just the right degree to cross the parking lot directly into the store. 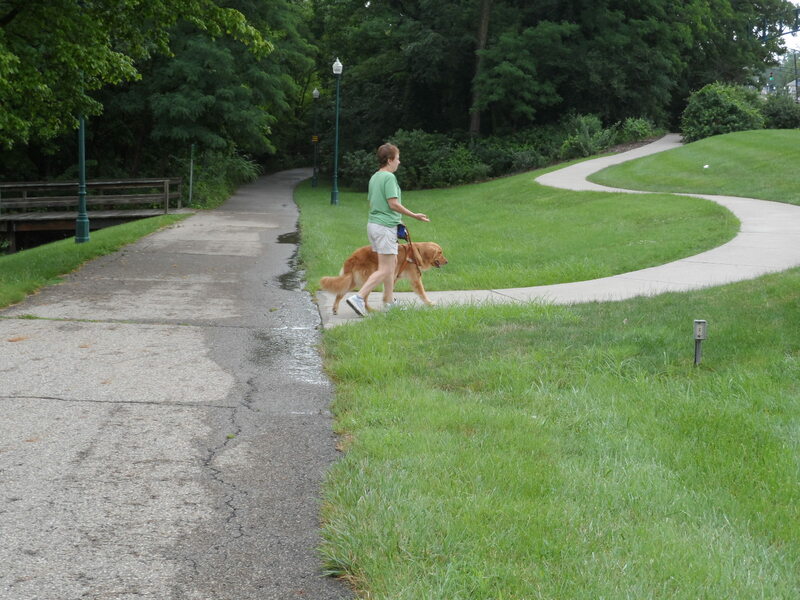 While I depend on my dog to walk straight from curb to curb, to go around obstacles, and to stop when the sidewalk ends and the street begins, I do have to know each step of the way myself. I cant just say to him, Let’s go to the coffee shop, and then hang on. Id love for the kind people who have been so helpful in this process to comment on their experiences. 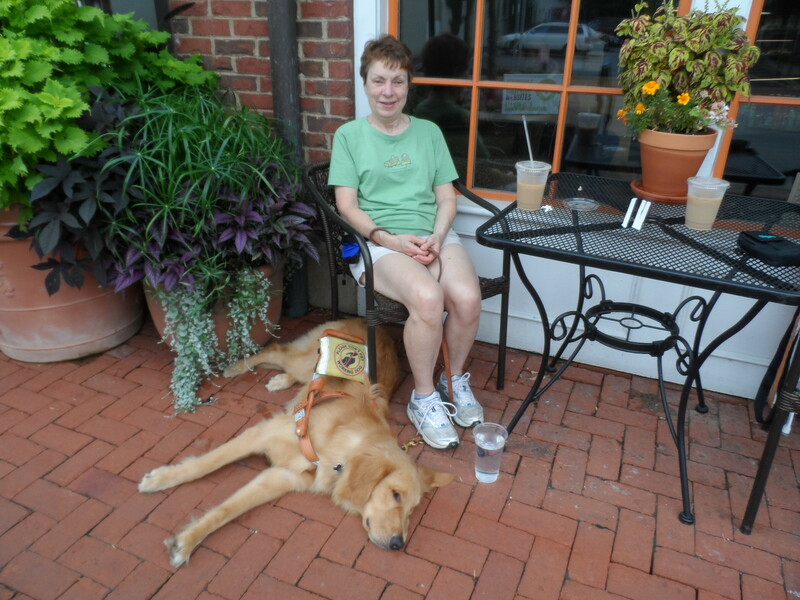 Photos, taken by Kara, show Cisco and me as we practiced clicker training at key places along the way. Does your family know what your wishes are for your funeral and the disposal of your remains and your treasures? Oh sure, you might have a will and a living will, but have you actually said out loud to someone who needs to know what you want done with your body? Nobody likes to have this conversation, because having it might hasten the need for it. But talking about it way ahead of time, when emotions and stress arent running high, makes the whole ordeal a little easier to handle. My mother has not only paid for her funeral and her burial plot, but she has also picked out her casket, the songs she wants played, and where to have the funeral luncheon. I know, the luncheon part is a bit over the top, but I am so grateful to her for having eliminated that whole dilemma of how much to spend on someones funeral. One of my friends who regularly reads this blog is a funeral director and pastor, so I hope she comments on todays posting. Mother and I sat down together last week to go over some details that we had already discussed last year, but she wanted to talk about them again. This conversation was not for me, but for her. She wanted to make sure I had the list of pall bearers she had chosen. Of course, she couldnt find the list she had made, so I suggested a few names we had talked about before. No, not that one, she said. Im saving him to be your companion. My companion? Yes, its customary to have someone stand with you at the gravesite. But my kids will be with me. Why would I need this other man to be my so called companion? Because it should be a man, she answered. Seriously? I think that rule of funeral etiquette went out some time in the 40s. But, whatever. If she wants to name this man as companion, thats fine. As I said, this conversation was for her. She wanted to make sure I would contact a certain woman at her church to organize the luncheon afterward. She suggested someone to ask to play the piano. Then we moved on to her obituary. She thought she had already given the funeral director the facts and dates needed, but a moment of inspiration came to me. How about if we list all the organizations you belonged to? What was the name of the college you went to? How long did you work at Chevrolet? What were your pen names for those books you wrote? By the end of the afternoon, she was feeling much better. Everything was in order, and her obituary sounded pretty darned good. She has always loved being in charge of everything, from what we were having for supper each night to where we would live. She was an officer in every club she was ever in, and always the president for at least one term. She thrived on planning. And she was good at it. Kara and I come by it naturally. Why not oversee what I write in the obit? Why not have a say in who carries her casket? I get it that she needs to have control, up to and including the end, but I draw the line at deciding what kinds of sandwiches to serve. Whats the best ending to a good joke? Laughter. Whats a dream come true for a banquet speaker? An attentive and engaged audience. Last night, I was blessed with both. I was the after-dinner speaker for the convention banquet for the American Council of the Blind, held in Columbus, Ohio. For weeks, I had been polishing and practicing, rewriting and reworking a speech about a group of women who hike together each year. The uniqueness of this group is that half of us are blind. The endearing quality of this group is that we know how to laugh, but more importantly, how to laugh at ourselves. My goal last night was not only to entertain, but also to inspire my audience to try new endeavors and to have fun while theyre at it. To my delight, my audience was eager and willing to hear my stories and to laugh at all the right places. In fact, they did such a good job of laughing, I often had to wait for the laughter to calm down before I delivered the next line. I felt like a real comedian standing up there, and I was loving it. The more they laughed, the funnier I felt. Im sure that part of my success was due to surprising them with humor. Who knew that a former executive director of a state affiliate would ever talk about 12 post menopausal women harmonizing to Girl Scout songs or hiking to the nearest liquor store to replenish our supply of wine and cheese. What really set me up for success though was that most of the people in my audience were blind. Blind people naturally communicate with each other verbally. A smile or a nod means nothing unless it is accompanied by something I can hear. When I speak to a sighted audience, there may be reactions of smiles and expressions of interest, but if I can hear it, I might think Ive bombed. This audience, however, let me know, each and every time, when something I said peaked their interest or tickled their funny-bone. The feedback was fantastic. Fortunately, they liked what I said, so everybody was happy. The best part was that they knew it and I knew it, because they laughed out loud. What a compliment. When I got home and played back the tape I had made of myself, I basked in the sound of laughter at my humorous speech. Laughter feels good, especially when youre the one telling the jokes. Dont you just hate it when somebody corrects your grammar? Maybe thats never happened to you, or maybe there are times when you feel like correcting somebody elses grammar. You dont though, because that would be rude. Come to think of it, the whole concept of using good grammar seems to be a thing of the past, considering all the abbreviated figures of speech we use nowadays in emails and tweets. But theres at least one place where good grammar is encouraged and even insisted upon. One of the roles I love to perform at toastmasters is that of Grammarian. For each meeting, one member takes note of any grammatical errors that are made during speeches and reports on the number of uhs and ums and other filler words that she heard that night. When someone is speaking in public, whether in person or via some electronic medium, he may be the smartest person in the world, but if he says something like, It might have went out, or For my wife and I, his credibility as an authority, for me, has just been destroyed. Being the grammarian gives me a good excuse to correct someones grammar. I loved English grammar in junior high. I loved diagramming sentences, because it appealed to my sense of logic and order. I loved identifying the category for each word and assigning it its proper place on the diagram. I know thats kind of geeky in a way, but it built the foundation for my understanding how our language works. For instance, the reason why for my wife and I is grammatically incorrect is that its a prepositional phrase, with the word for being the preposition and the objects are my wife and I. But you see, the Word I cannot be the object of anything. It can only be used as the subject. The phrase should be for my wife and me. For some reason, people seem to be afraid to use the word me. They often will substitute the word myself incorrectly as in, Just call my wife or myself. Again, it should be, Just call my wife or me. I once did a speech called, Its all About Me. As for the It might have went, mistake, its a matter of laziness in speech. The same is true for he had ran. Today I read an article written by a famous public speaker, and he actually wrote It might have went. Ouch. I physically recoiled at his error. How could he do that to himself? That young man needs a Toastmaster Grammarian to correct the errors of his words. As Cisco is introduced to more and more of my groups and activities, Ive noticed that there are 2 most often asked questions about a guide dog. Of course, the first one that comes to mind is, whats your dogs name? People will ask that as they step into the elevator with you, as if thats more important than anything else. When they sit near you in church, at a meeting, on the bus, its the first thing that comes out of their mouths. Not Hi, how are you? Not thats a beautiful dog. Not, and wouldnt this be great, Hi, my name is . And whats yours? No, its whats your dogs name? Its not a good idea to answer this question directly or even honestly. We dog guide handlers address this question in several ways. The best way is to explain that the dog is on duty, and therefore should not be distracted by the attention of a person other than his handler using his name. But this is way too complicated and long. Sometimes, we say, Hes working right now, so hes not allowed to be social, but my name is. Some handlers prefer to be blunt and say, I dont tell people his name. others will make up a name, because we know that as soon as we tell someone the name, that person is going to talk to the dog. Then we have to tell them not to do that. I like the made up name best, and Ive decided on one that will get the message across that Im not about to tell you his real name. when people ask me, I say Handsome Dude. It worked the other day in a restaurant as I was sitting on a bench with another lady, waiting to be seated. Her friend, who was standing nearby, asked her what the name of the dog was, and she said, Handsome dude. The other most commonly asked question is not How old is he? How long have you been together? Where was he trained? although these questions are frequently asked. No, what they always want to know is, does he sleep with you? Seriously? Is this because they let their dogs sleep with them, and they want to know if Seeing Eye dogs are allowed to do the same? Or, do they think the dogs job is to be with me constantly, even when Im asleep? Or, are they hoping he does, because they think he should be pampered when hes not working? Well, heres the answer for those of you who havent yet asked that question, although youve been dying to know. No. He sleeps in a crate, because thats what hes used to. He had a crate when he was a puppy, and he had a crate in our room at The Seeing eye. Now he has a crate, just like the one at the school, in my bedroom. Its a really snazzy one, made of see-through fabrick, which he could probably chew through if he had a mind to. But he seems to be quite content in there at night. Sometimes, he goes in,even before Im ready to go to bed myself. Its like hes saying, You can stay up all night, but Im tired, and I want to go to bed. Im not promising that hell never get to sleep on my bed. After all, when Pippen got old, she was allowed to curl up next to me every night. But for right now, establishing that Im the alpha in this family is very important. Meanwhile, I look forward to the questions, because for right now, Cisco, that is, Handsome Dude is my favorite topic of conversation.